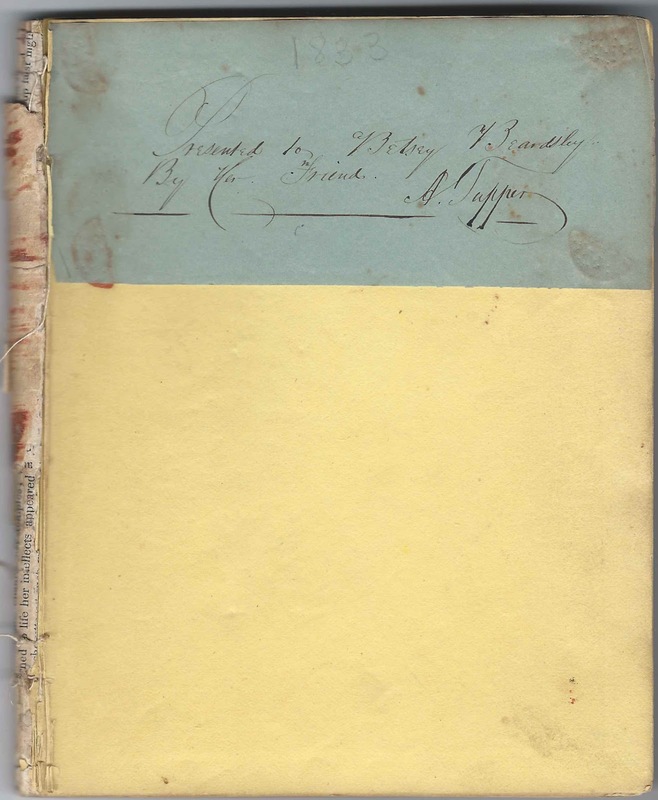 1830s autograph album of Betsey Beardsley of Scipio, New York. The album was presented to Betsy by A. Tupper, as shown on a blue scrap of paper pasted on the first end paper. 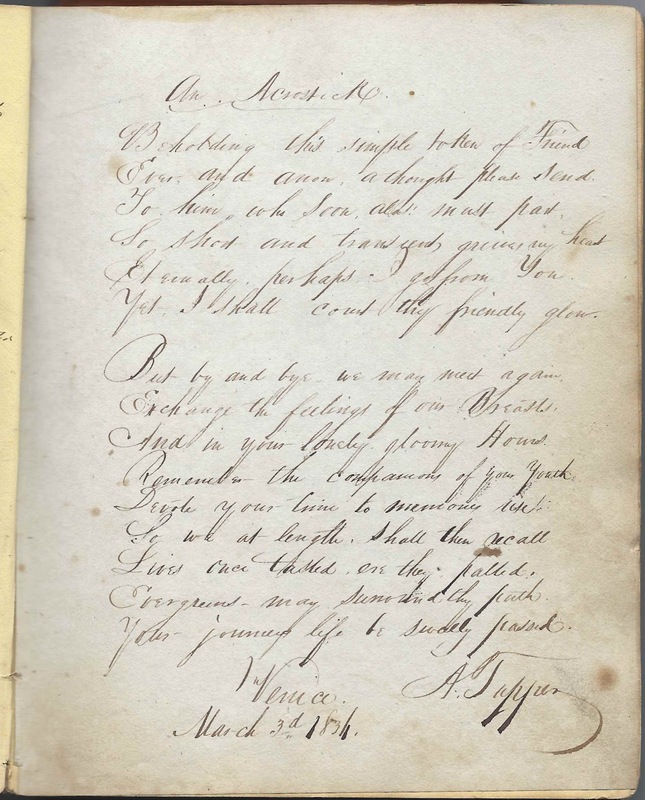 The first two inscribed pages, facing pages, in the album were signed by Asa Tupper and the third by A. Tupper, presumably the same person as above. I believe he was Dr. Asa Wilbur Tupper (1816-1895), son of Josiah and Mercy Mary (Wilbur) Tupper. 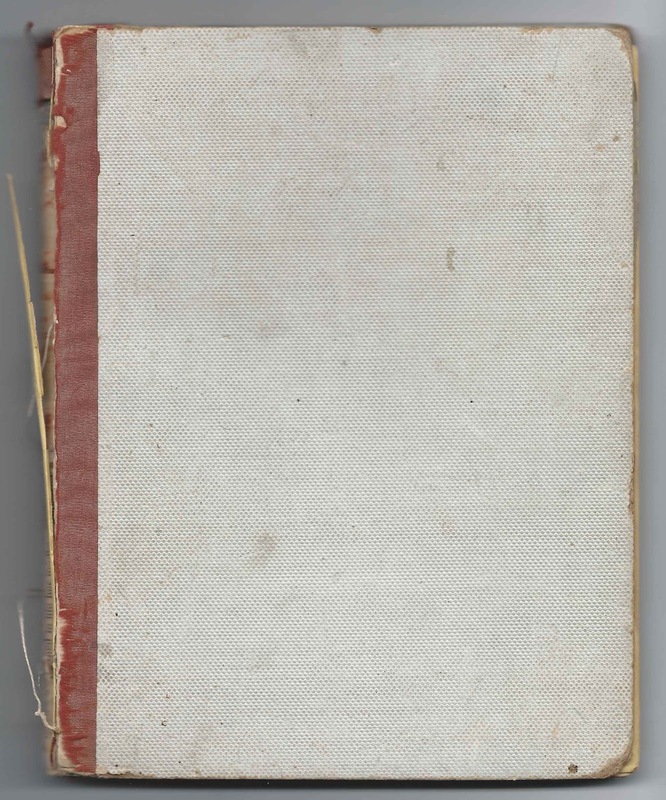 The album is approximately 7-3/4" x 6" and contains the sentiments of 39 of Betsey's relatives and friends. An alphabetical surname list and an alphabetical list of the signers, together with any personal information they might have offered, appear at the end of this post. The Young Lady's Remembrancer was published in New York by J. C. Riker in 1833 and includes several engravings interspersed throughout. Elizabeth Beardsley, "Betsey", was born 17 June 1820 in New York, I think at Scipio, the daughter of Jared and Betsey (Bennett) Beardsley, both Connecticut natives. 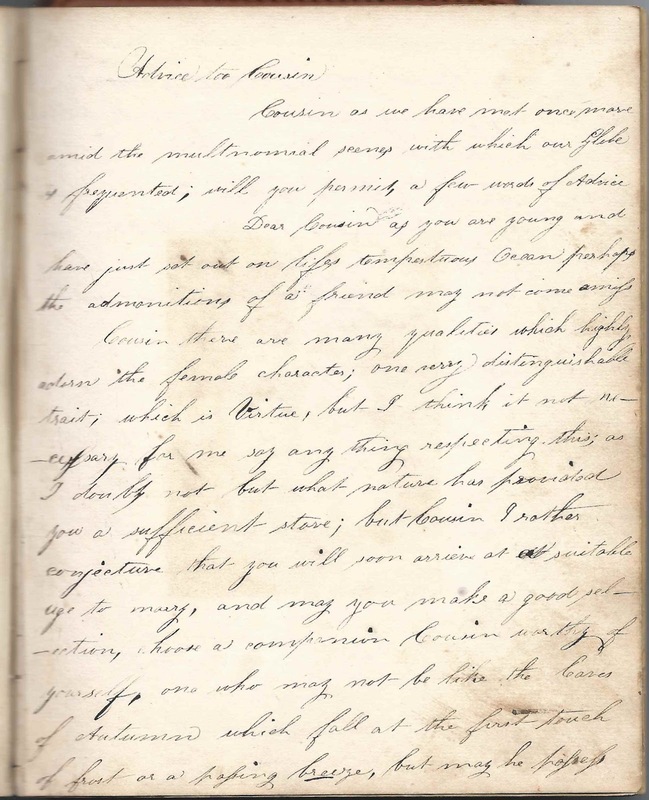 The J. Beardsley, Jr., who signed a page, may have been Betsey's brother Jared Beardsley, Jr., who was born May 30, 1816 at Scipio, New York. He married Mary Jane Gray in 1838 and moved to Michigan, where he died at Bay City in 1887. Two people mentioned that they were Betsey's cousin. One was A. B. of Naples, presumably in New York, who signed a two-page sentiment. The other was cousin Fayette, who signed on the inside back cover of the album. The person from whom I bought the album felt that the it had belonged to the Betsey Beardsley of Clinton, New York, who married Hiram Lamson, but what convinced me it was the Betsey born in 1820, as noted above, was the fact that it contained a page signed by J. G. Sheffield. The Betsey born in 1820 married John G. Sheffield at Scipio, New York, on June 13, 1847. Betsey and John lived at Auburn, New York, at least until the time of the 1860 Census. Betsey died in 1862, according to the book "William Beardsley of Stratford, Connecticut & His Descendants", though I haven't substantiated that. After that, it appears that John headed to Michigan and married again. He died in 1892 and is buried at Battle Creek, Michigan. Eliza P, signed at Scipio, New York, on September 26, 1836. Surname might start with P or R and end with "ing". Betsey's cousin ? A. 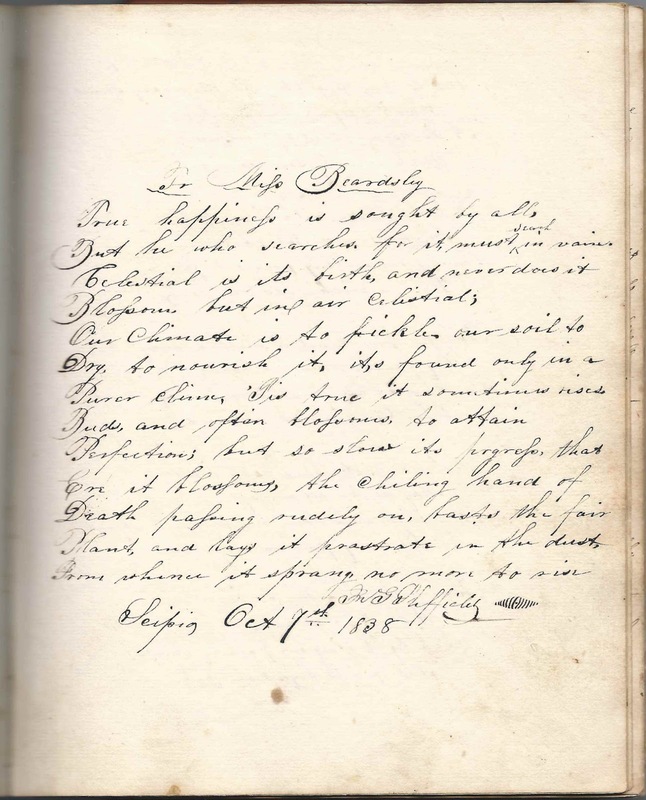 B. of Naples, presumably New York, who inscribed a page and its overleaf. A. H. or A. K.
William H. ? 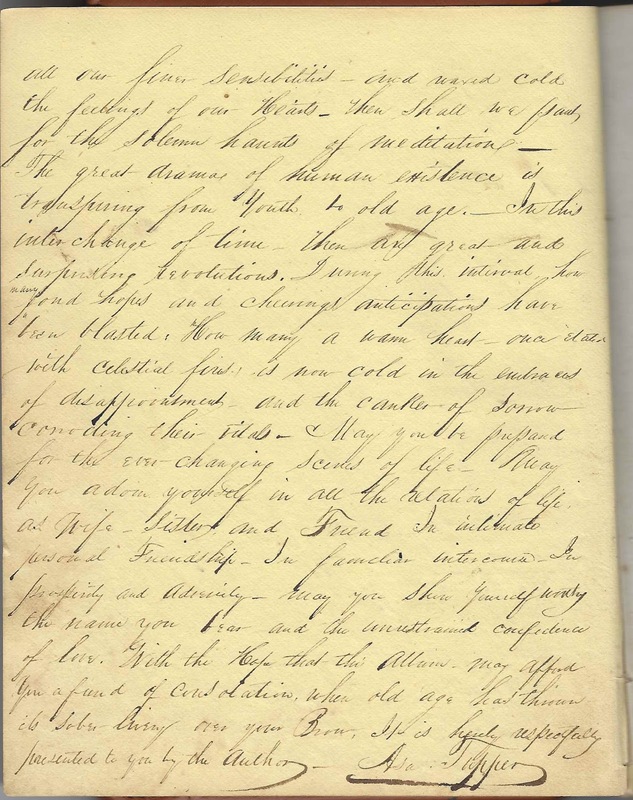 at Scipio, New York on August 24, 1837; surname starts with S. Signed facing pages. 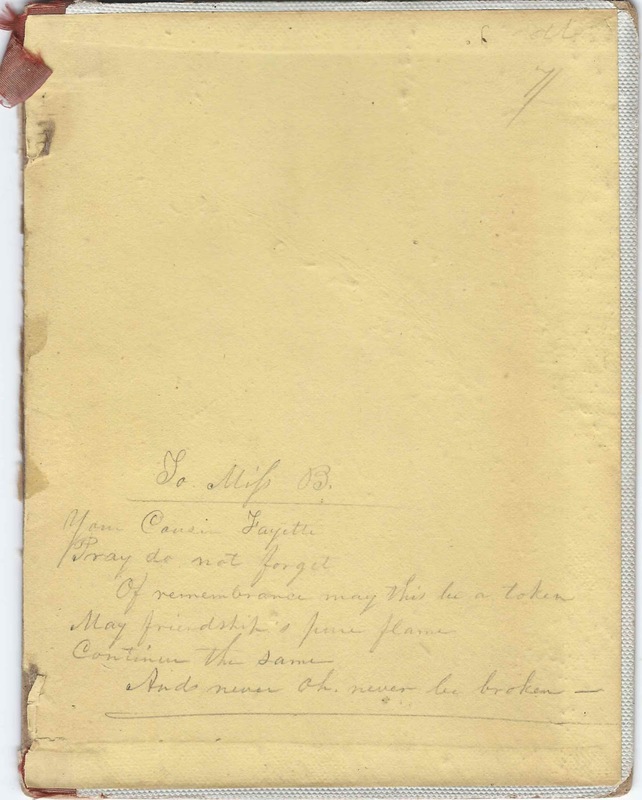 "Presented to Betsey Beardsley By her Friend A. Tupper" Presumably Dr. Asa Wilbur Tupper (1816-1895), son of Josiah and Mercy Mary (Wilbur) Tupper, who inscribed the first two pages in the album. J. Beardsley, Jr.; possibly Betsey's brother Jared Beardsley, Jr.
B. B. King of Scipio, New York. Presumably Benjamin B. King of Scipio, New York. Christopher E. Roffee, signed at Scipio, New York, on April 6, 1836. He may have been the Christopher Earle Roffee born about 1798 in Rhode Island, or his son Christopher Earle Roffee born about 1819. I'm leaning toward the elder Christopher because of the inscription of Mary Ann (Dickens) Roffee, his wife. They later moved to Cayuga County, New York. 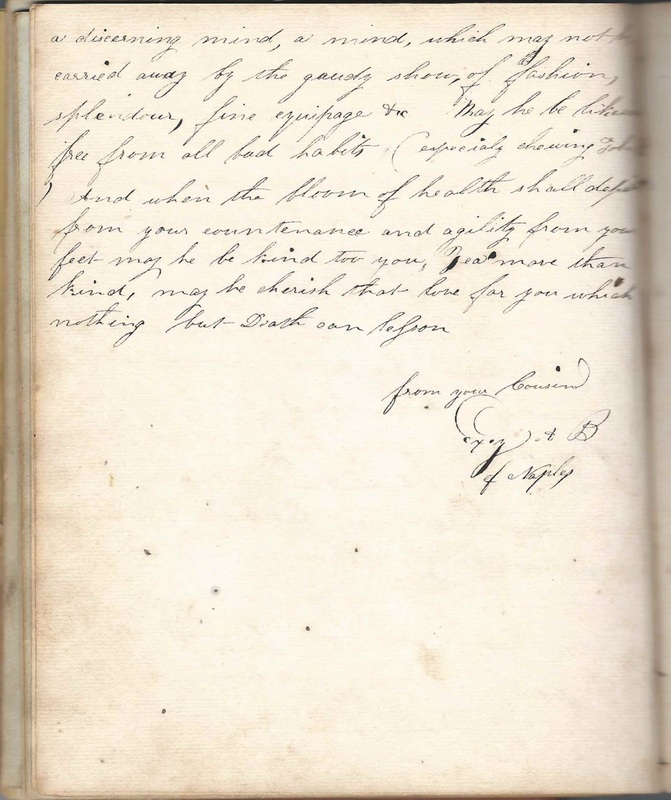 Mrs. Mary Ann Roffee, signed on April 8, 1836; Mary Ann (Dickens) Roffee, wife of signer Christopher Earle Roffee. Martha Roffee; she was presumably Martha A. Roffee, sister of inscriber Christopher E. Roffee. A reader feels that Martha married a Mr. Rollins. Roffee - contact me for more information on the Roffee family, including obituaries for Christopher Earle Roffee and wife Mary Ann (Dickens) Roffee, sent me by a reader. 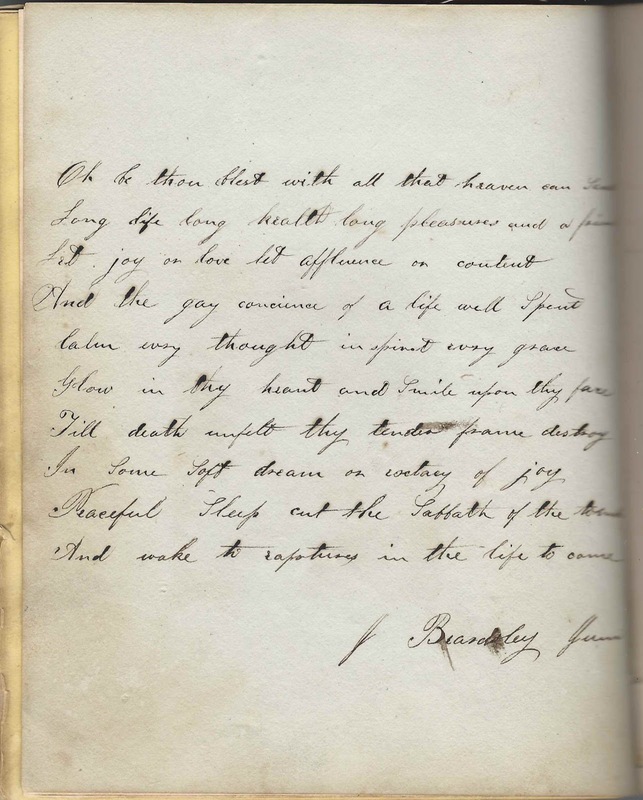 J. G. Sheffield, signed at Scipio, New York, on October 7, 1838. John G. Sheffield, future husband of Betsey Beardsley. 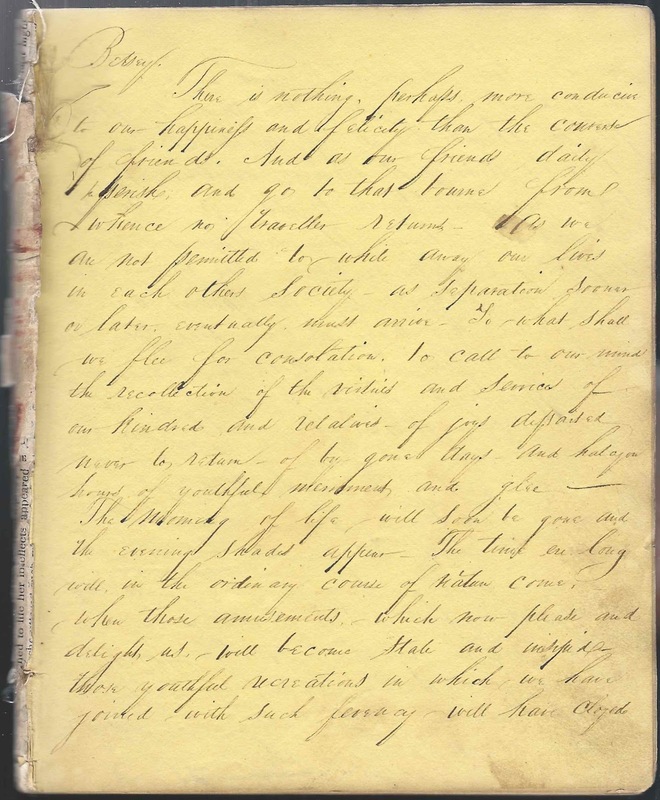 Amy Taber, signed at Scipio, New York, on April 3, 1836. Not positive of either name, but there was an Amy Taber born 1817 at Scipio, New York, daughter of Wing Taber and Mehitable (Bowker) Taber. 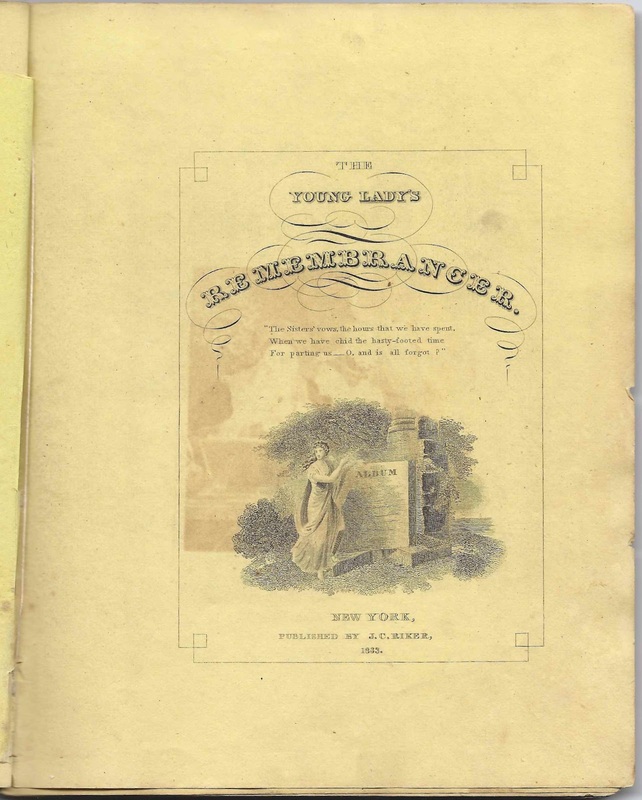 Dr. Asa Wilbur Tupper (1816-1895), son of Josiah and Mercy Mary (Wilbur) Tupper, who presented the album to Betsey and inscribed the first three pages in the album.